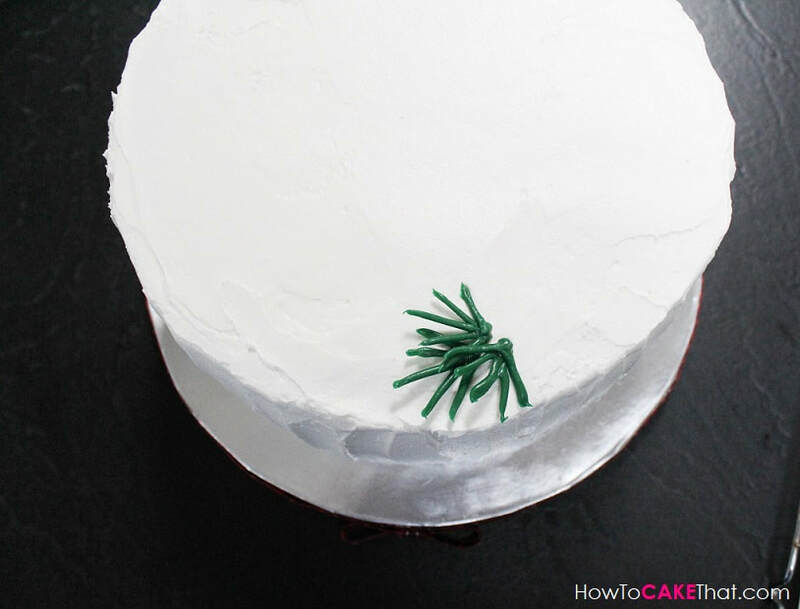 Merry Christmas, Cake Friends!! I hope you are enjoying this lovely holiday season! And I hope you have a lot of fun festive plans with your family and friends! 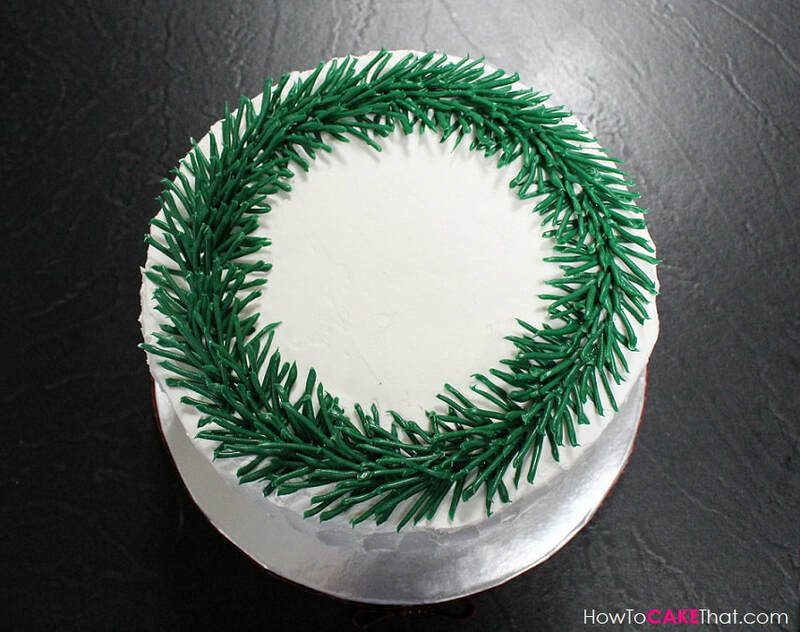 If you need a new idea to bring to the Christmas dessert table at your next Christmas party, why not make a Christmas wreath cake made with chocolate pine needles! Not only is it beautiful and pretty realistic looking... it's yummy!!! And it isn't difficult to make! 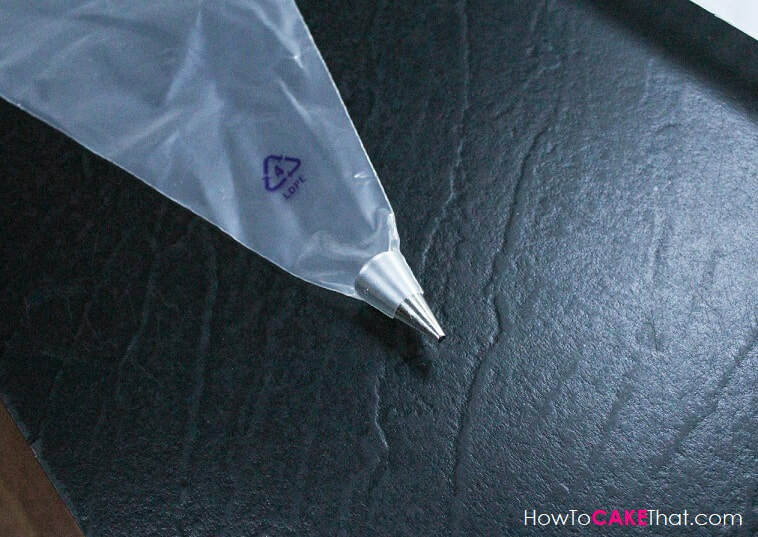 To get started, I placed a Wilton #4 round piping tip inside of a piping bag. 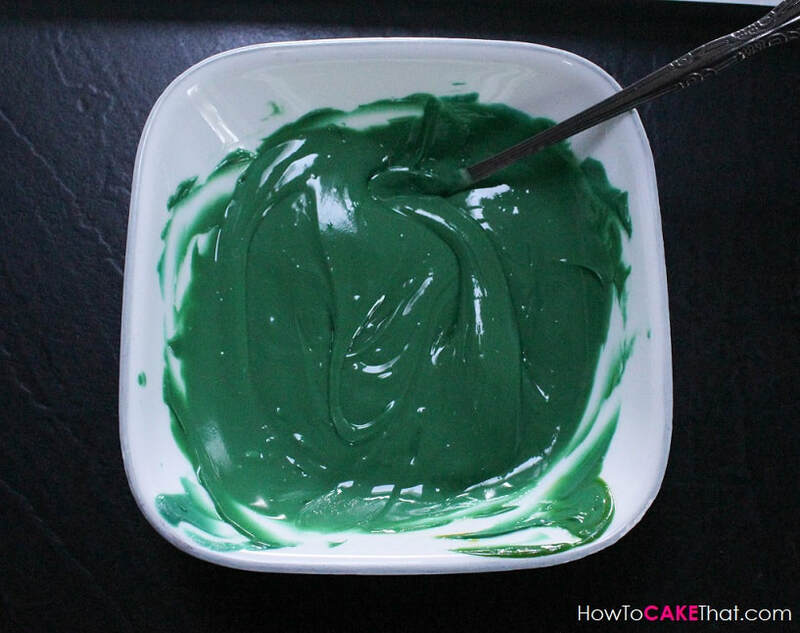 Then I poured a good amount of Wilton's green candy melts into a microwave safe bowl. Now this part is totally optional! 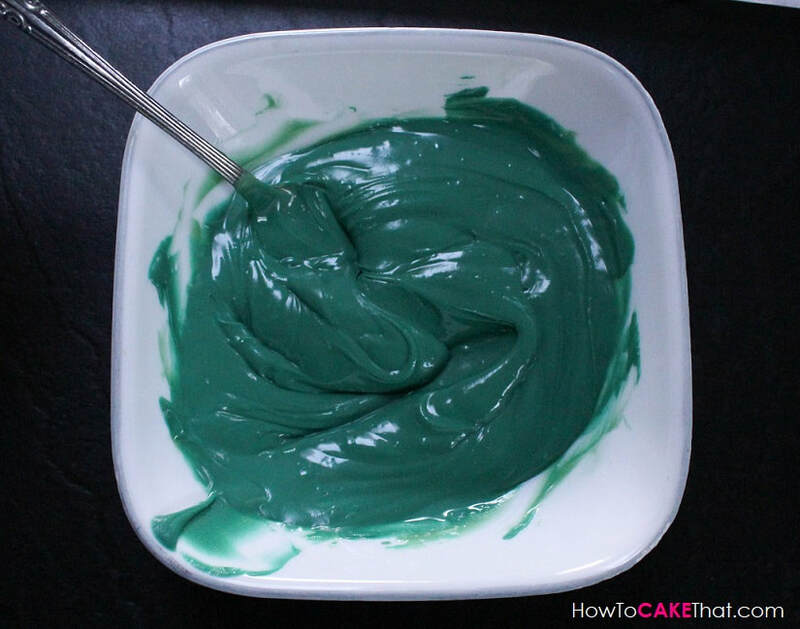 The Wilton green candy melts are a pretty shade of green, but they were a little lighter than I wanted for my wreath. 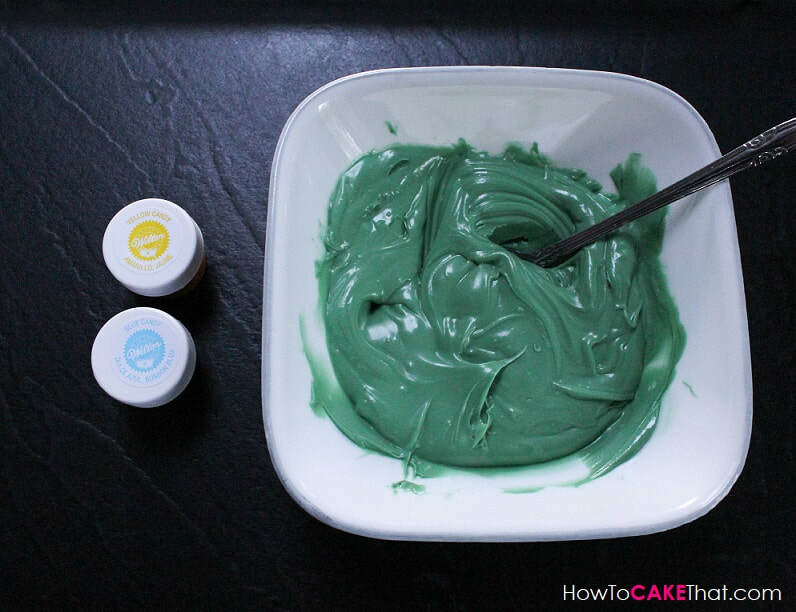 So I used Wilton's oil candy colors in blue and yellow to darken the candy melts. First I added a lot of blue color to the candy melts to darken the color. 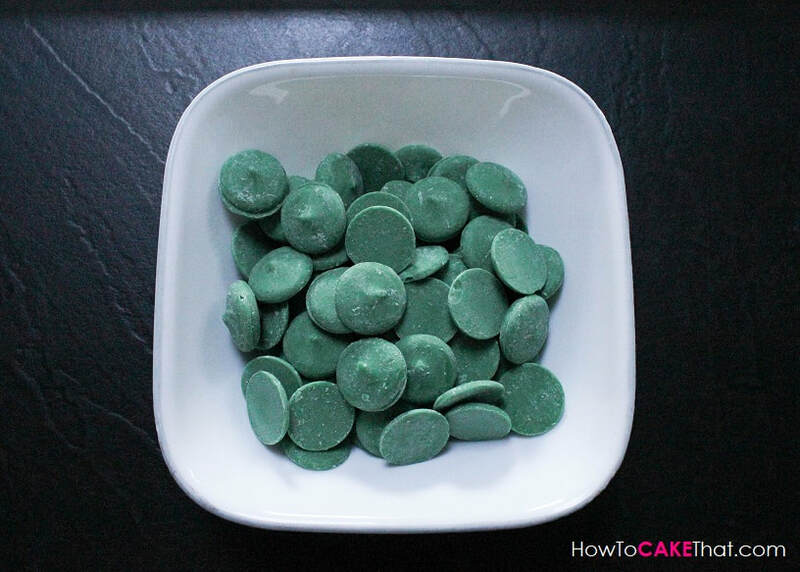 I placed the candy melts back into the microwave to warm the mixture once more. 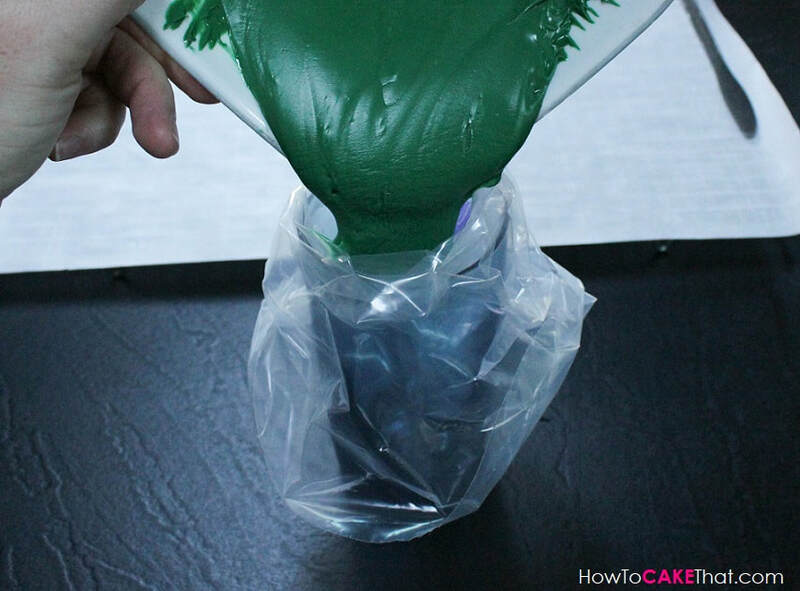 I placed my piping bag into a tall glass and poured the warm melted candy melts into the piping bag. 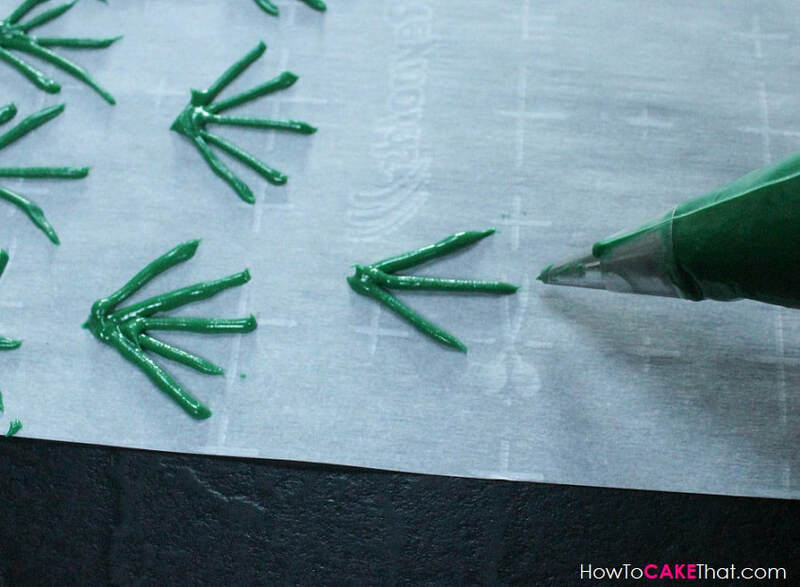 To create the pine needles, I placed a sheet of parchment paper onto my countertop. The ends of the parchment would not lay flat, so I used two butter knives to hold the ends in place ;). Then I piped a small V shape onto the parchment. 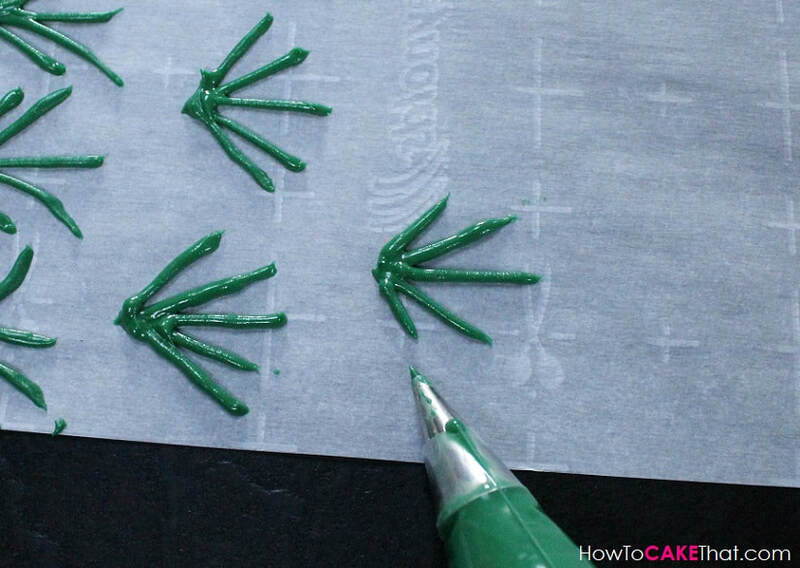 Note: It's important to use parchment paper. 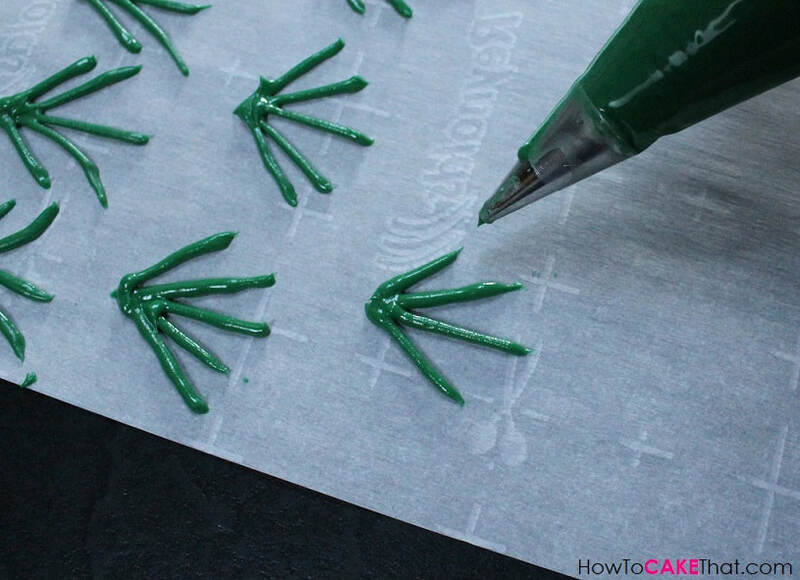 The pine needles are very fragile and they are the easiest to remove from parchment paper once they've cooled and hardened. Next I piped a small line in the center of the V.
Then I piped a 4th pine needle on the outside of the V.
And then one more on the opposite side. 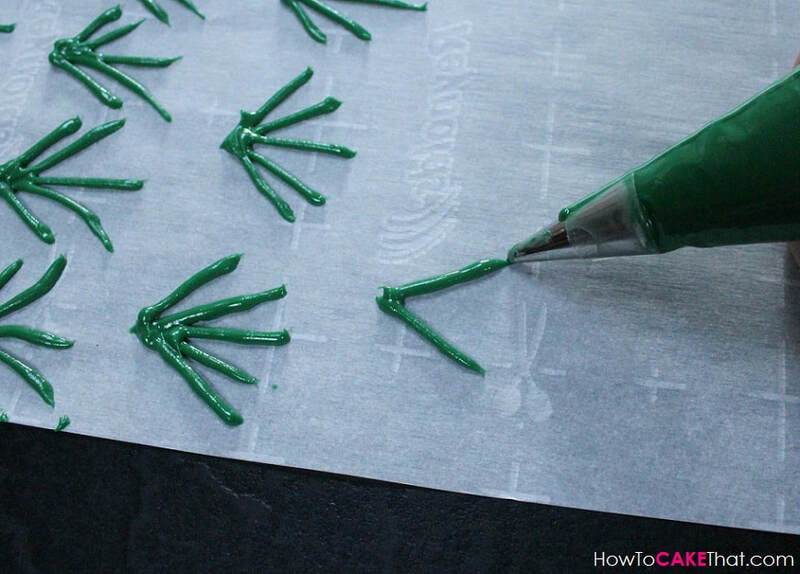 Repeat those steps to make many many more pine needles! 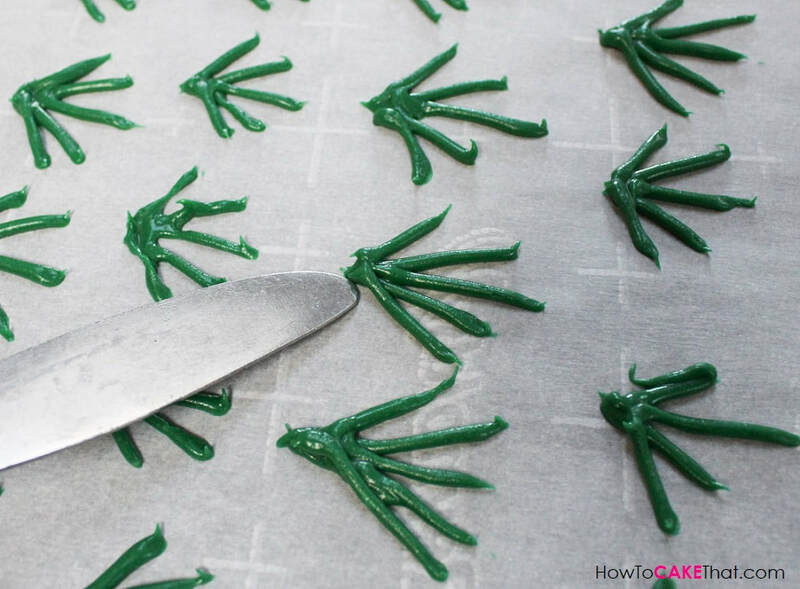 Let pine needles cool and harden. 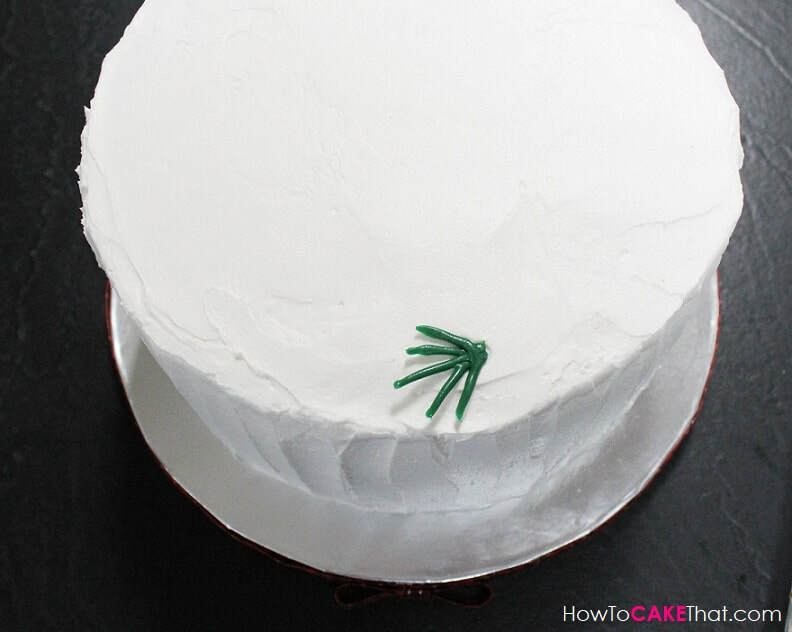 After the pine needles have hardened, gently nudge the backside of the pine needles with a butter knife or your finger to release them from the parchment paper. 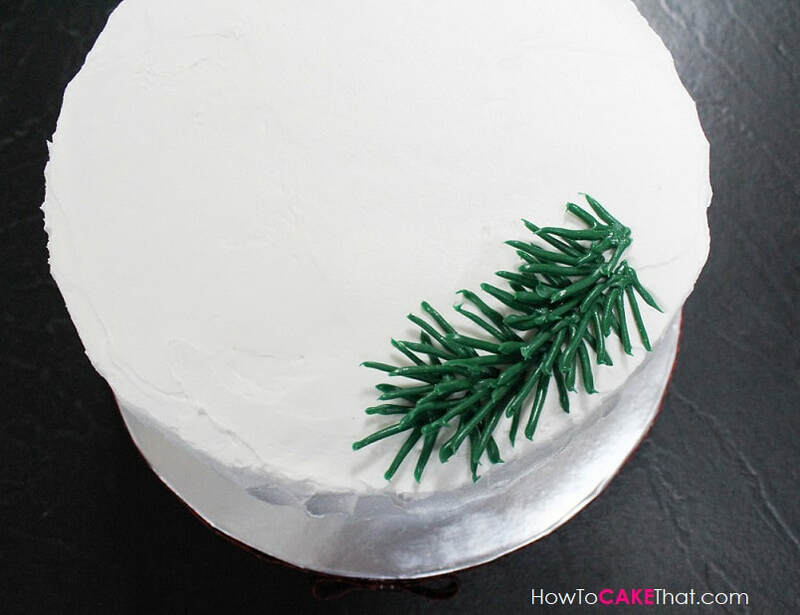 Frost a cake with a buttercream of your choice, and begin placing the pine needles onto the cake one at a time. 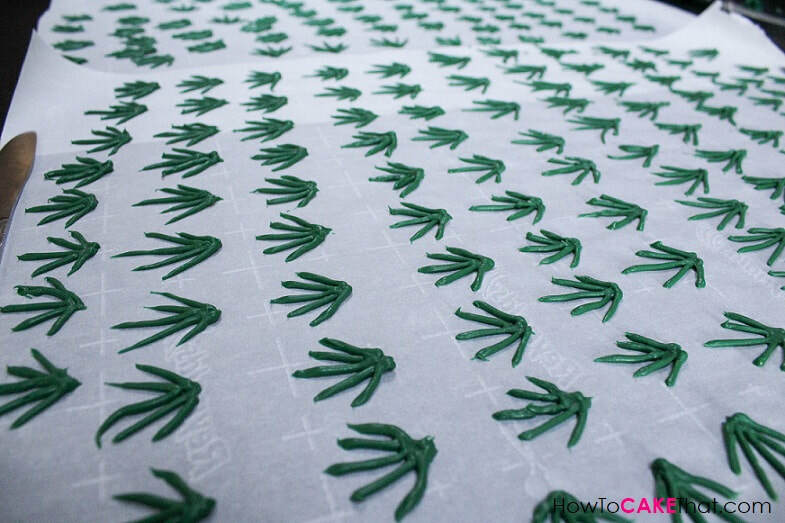 Note: I am working on an 8" cake. 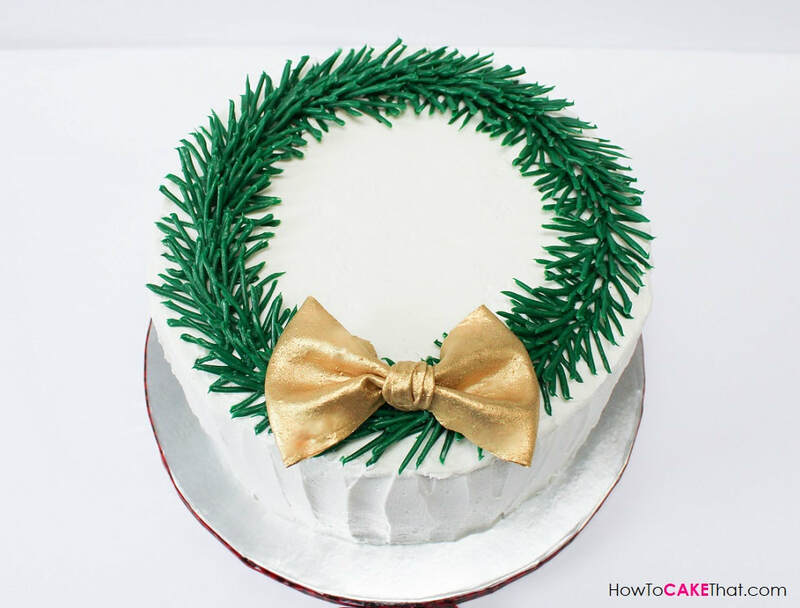 Overlap the pine needle clusters as you build your wreath. Doesn't that look so lovely!!! 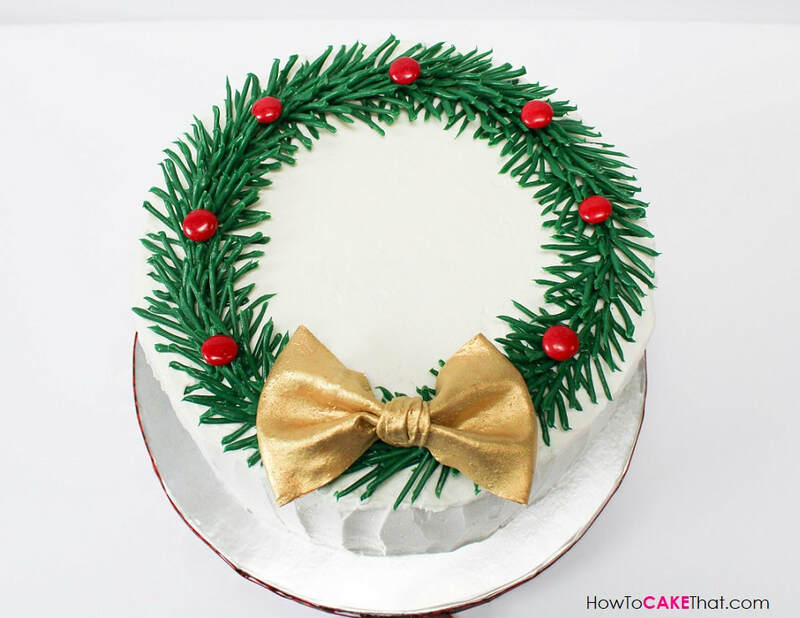 The wreath has a natural beauty and could be served just like this! But I like to dress mine up! Here I have attached a gold bow made from my Magic Gummy Vinyl Recipe and Rolkem Super Gold dust. (Bow Tutorial Coming Soon!). The gold bow adds a beautiful elegant touch. I decided I wanted a more festive look, so I decided to add some color! I placed red M&Ms facedown onto the pine needles and glued them in place using a little leftover candy melts! The red, green and gold just made it look much more Christmassy! Just what I was going for! I hope you have enjoyed this tutorial! Merry Christmas, and God bless! !